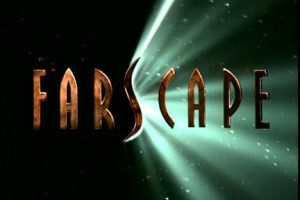 So after a three-part nail-biting action extravaganza, Farscape decides it’s time to slow things down just a bit and then SHOVE US ALL THROUGH AN EMOTIONAL MEAT-GRINDER! Don’t you just love this show? With Moya still ravaged by the fire and stress incurred in Liars, Guns, and Money, John beginning to completely lose it due to Scorpius’s neural chip, and everything else going on, nearly every character is riding a ragged emotional edge. This episode is a tug of war on two levels – internally between John and the chip, and between John and the crew as he continually tries to get away and gets thwarted. Sure, they’re rich, but no one is having a good time. Zhaan’s wracked with guilt, D’Argo’s having trouble with Jothee, and no one knows how to help John. And the rest of the episode sure doesn’t help. Hoo boy. But we’ve come to care about these characters so much at this point that it’s just so compelling to watch and hope, somehow, they can find their way through it. Of the two emotional plotlines here, the lesser one is between D’Argo , Jothee and Chiana. Along with being stressed about Moya and scared for John, D’Argo’s clearly hurt and angry that Jothee mutilated himself because he didn’t want to be Luxan. D’Argo’s never been great at dealing with feelings, and it’s making him unstable, which of course doesn’t help matters with Jothee. It also drives a rift between him and Chiana, which gives those two something else to bond over upon the discovery that, D’Argo wants to settle down with them while they both want to live loud. Add to Chiana’s side of the equation her grief over Aeryn’s death and—as much as I like Chiana let’s be honest, here—her emotional immaturity, and it all creates a recipe for some Jerry Springer-like uncomfortable situations that will continue to develop in the next season. Meanwhile, after two seasons of struggling with being able to open up enough to admit to John that she loves him, the two finally share that moment. Except it’s all a nightmare because when they both say “I love you” for the first time, John isn’t even in control! He doesn’t even remember having said it later, so you know that’s just going to do wonders for Aeryn’s trust issues. Or at least it would, except shortly after she’s dead! Come to think of it, being killed probably would give someone trust issues, too. I don’t honestly know what I thought when I saw this episode the first time. I’m not sure I even knew WHAT to think. Obviously I didn’t want Aeryn to die, but I wasn’t really able to see how they could bring her back, either. Yet it seemed so…unfathomable for them to kill her off for good, too. The horror of seeing Aeryn about to die does at least manage to break John out of Scorpius’s control long enough for him to let himself be recaptured so they can help him. Even so, I’m sure that’s not really a comfort for anyone, least of all John. It’s an emotional ringer of an episode, and exceedingly well-executed. (Er, no pun intended.) 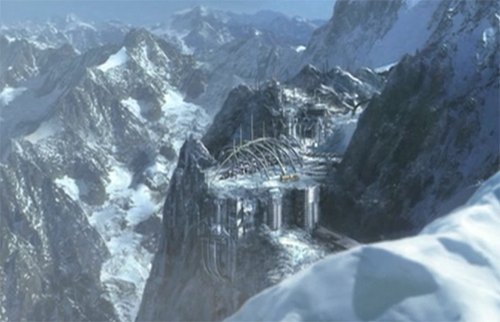 While we get intriguing new characters—the diagnosan is as amazing as Grunchlk is seedy—a beautiful ice planet (which I confess also reminded me a bit of Skyrim), and great acting all around, this episode owes the most to Ben Browder’s acting. His Scorpius impression is spot on and creepy on multiple levels, and it gives this episode even more emotional impact. Incidentally, the scan of John’s brain with the tendrils all over it is probably one of the most disgusting things in this show. I do like the idea the chip actually grew, building its tendrils through some sort of nanotech or something. Did it steal nutrients and such from John’s bloodstream to construct itself? This gives me all sorts of ideas. John sings the 1812 Overture. Later on he’ll be teaching a certain DRD to do that. If the doc can fix Grunchlk’s hearing, why can’t he do something about his skin issues? Or does he just really need a hanky? It never occurred to me that Rygel contracting for another ship might have wound up being part of how Scorpius got there so fast. But then John sent the signal, too, so I’m not sure. If the two things aren’t connected, then the two scenes that deal with this don’t really serve much purpose. On the other hand, it does let us know that Rygel hasn’t suddenly stopped looking out for himself, and Farscape does like to include pure character scenes when it can fit them in. But I still can’t help but wonder. Is it just me, or does Ben Browder look a lot like Jack Palance when he’s in the Scorpy makup?